The newest plugin version includes support for JRebel Remoting, which is configurable via the project view. The plugin oversees the state of the project and communicates to the JRebel agent running in the application on remote hosts in order to synchronize the files between your IDE and the running application. 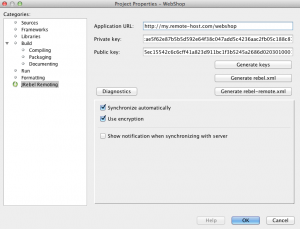 If any changes are detected in the project, the plugin can synchronize the files automatically or on demand, and the JRebel agent can then update the application without redeploys. The Configuration Wizard that used to be a standalone application bundled with the plugin is now a part of the native NetBeans UI, accessible from the Options dialog. 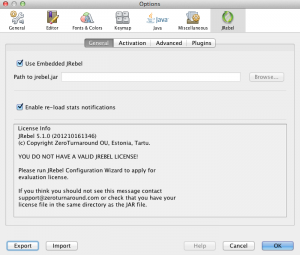 Via the new UI you can configure the agent, logging, select JRebel plugins and activate the license. Finally, NetBeans 7.2 now provides an API that we can use to contribute JRebel arguments to the launcher. So whenever you launch the application, and JRebel toggle is enabled, we are able to automatically set the correct VM arguments, e.g -javaagent. This was a long standing issue for JRebel plugin and we had to do some very interesting workarounds in order to do the same on pre-7.2 NetBeans versions.